Trumpet vine growing vine of the genus Campsis also known as Campsis radicans, Trumpet vine perennial deciduous used as attract pollinators ornamental hedge plant, can grow in subtropics, temperate, mediterranean, desert or tropics climate and growing in hardiness zone 4+. Leaves color green in drop shape to deltoid leaf margin serrated and leaves grow in in pinnate structure. Flower color can be orange, yellow or red in trumpet shape. 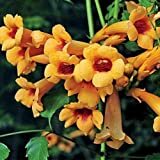 New Campsis Radicans - Trumpet , Or HUMMINGBIRD VINE Orange / Red FLOWER , 20 + Seeds !